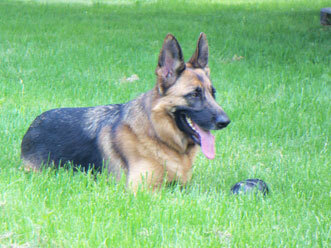 I would like to enter Calypso for the GSD of the Month Photo Contest. She is a 2 year old GSD that I adopted from the Mid Atlantic Germans Shepherd Rescue a year ago. The rescue saved her from a certain death at a local animal control shelter. "Cali" is as sweet as can be to everyone, lives to play tug/fetch, great with other dogs and very, very smart. She is soon to be a certified Explosive Detection Dog and will be working with me and my other K9 - Rocky. Cali is definitely a rescue success story!!! Hi Michele, thank you so much for telling us all about your great rescued German Shepherd Cali. She is really a beautiful German Shepherd Dog! What a wonderful story and what a great companion you have there. And what a wonderful accomplishment for her to become a Explosive Detection Dog. That is fantastic - she must be really smart and playful too! Good for "Cali" How cool is that to be a certified Expolsive Detection Dog, she must be one smart cookie! Thank God for the Mid Atlantic German Shepherd Rescue and shame on that local animal control shelter who wanted to end her life, what a terrible waste it would have been and now she has a wonderful and meaningful life. Take care.